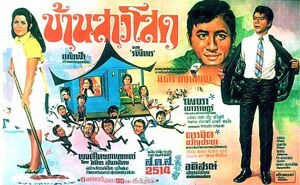 This Jomchai Jarintorn movie page contains 4 records. 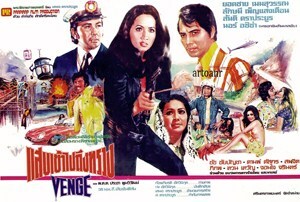 This 1974 movie “แสบเข้าไปถึงทรวง” is lost in Thailand but is still available in Malaysia under the title “Dendam Perawan” / “Vengeance” as it features a Thai Malaysian actress (Lakshmi Pensaengdeuan - ลักษมี เพ็ญแสงเดือน). Summary might be a bit inaccurate as the movie is dubbed in Malaysian only. Yodchai (Yodchai Meksuwan) is fiancee together with a young Malaysian lady called Ning. Dam (Dam Datsakorn) sees the jewels offered as gifts. Dam, being the fiancee's sister, decides to rob the jewels and kills the middle age lady to succeed. A little boy sees him but he is thrown across the stairs. The mother has time to write the murderer name with her blood. 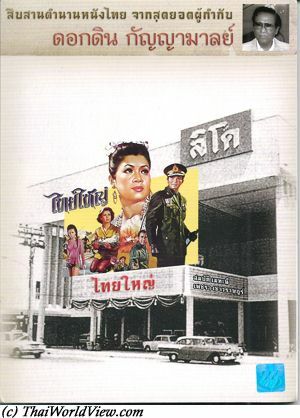 Ning does her enquiry inside Bangkok low cost hotels to find Dam. She is able to drive fast car, knock out ruffians and throw knife. She finds Dam's house but he is not here. Fighting happens with ruffians but Yodchai comes to help on time. Ning goes to Malaysia to continue the investigation. Her friend is a pilot and loves her secretly. Dam is aware that Ning is looking for him. The pilot finally starts a romance with another Malaysian lady. Dam's ruffians try to stop her. They get beaten one by one! Finally they find Dam's secret home. Following violent fighting, Ning and Yodchai are defeated. Ning is put in Dam's car trunk. The pilot and Yodchai still follow them to prevent Dam escaping by helicopter. Ning defeats herself Dam and refuses to give him any chance opting for self justice. Unfortunately her friend, the pilot, has died during the fighting. This movie is mainly shot in Malaysia. 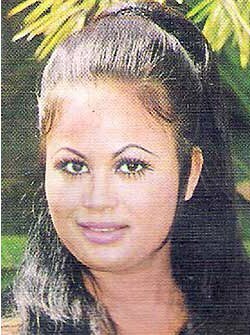 The actress Lakshmi has the main role. Thai veteran actor Yodchai Meksuwan has a second role. The movie features great views of Kuala Lumpur with old buildings and old mosques. The movie features a few famous Malaysian actors, i.e. Noor Azizah, S. Roomai Noor, Karim Siraj.